Your Maui vacation should be nothing but extraordinary. The island is a stunning place to contemplate nature’s wonders, especially during a magical Maui sunset. After spending the day on a gorgeous, pristine beach, there’s nothing like sitting down with the ones you love and gazing at the horizon as the sun goes down. Discover the top five spots to watch a Maui sunset and have an experience you’ll remember for the rest of your life. Don’t wait another minute, the Hawaiian dream is calling you! Haleakala National Park is one of the most scenic places on Maui, and probably the world! Picture this: you’ve just hiked through a beautiful tropical forest, and you are now sitting on top of a volcano with the people you love most. The colors are vibrant purple and orange, endlessly spreading in the infinite horizon. If it’s a cloudy day, you will feel like you’re floating on top of the world! Kapalua Bay Beach is a beautiful spot during the day and makes for gorgeous photoshoot sessions. When twilight comes, the rocky outcrops transform into a real-life water mirror! Suddenly the surroundings melt into a pool of gold and purple, and you are left enchanted by this magical spectacle. Keawakapu Beach is an isolated beach stretching more than half a mile. Have a picnic on the pristine white sand and watch the orange sun melt into the dark waves of the ocean. The mountains on the horizon play with light in a mesmerizing way, and the black shadows all get mixed with the clouds. Experience it all from the comfort of your beach towel! You have to earn your sunset on the Lahaina Pali Trail. To get to the viewpoint, you first have to hike 500 vertical feet from the Ukumehame trailhead, but it’s worth every effort! The panoramic view is breathtaking (probably the best on the island) and you can see whales from time to time. Don’t forget to bring a flashlight with you for the way back! Po’olenalena is another secret spot hidden between the South Maui resorts and the Big Beach area. Also known as Chang’s Beach, it’s a perfect evening spot to watch a gorgeous Maui sunset. Here is your chance to immortalize your Hawaiian vacation in front of an electric orange sky! 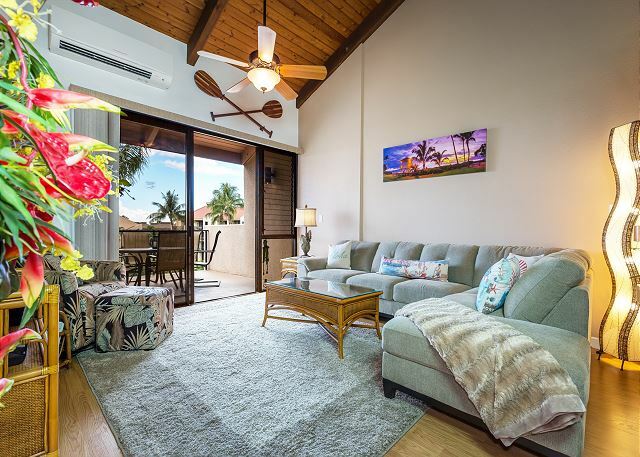 After admiring a stunning explosion of colors at these Maui sunset spots, come home to a comfortable PMI Maui vacation rental. 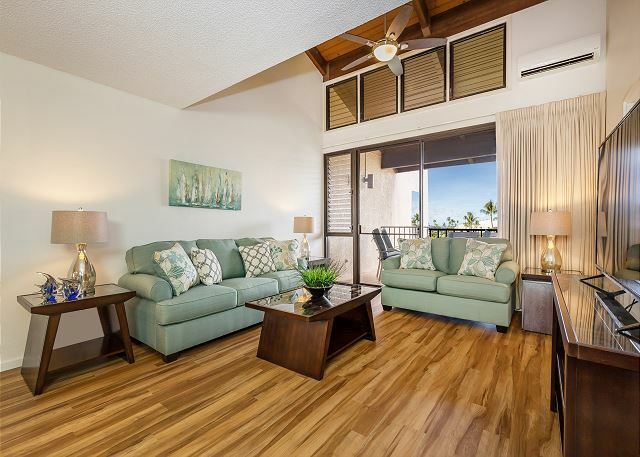 Our modern properties are the perfect place to enjoy a magical Hawaiian getaway either with your family or your significant other! 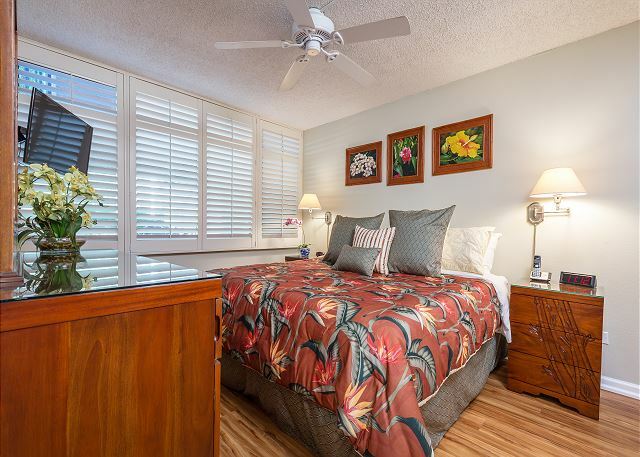 Our Kamaole Sands 3-106 is ideal for a relaxing stay. 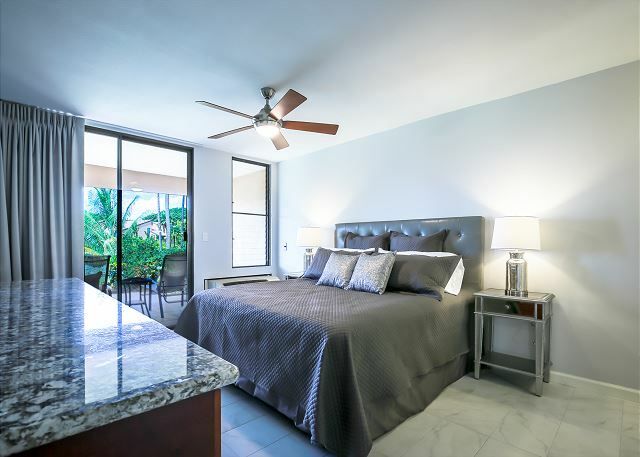 Lay back and enjoy a glass of wine on the shaded lanai, then take a hot shower to get rid of the sand and have a good night’s sleep in a luxurious king bed. 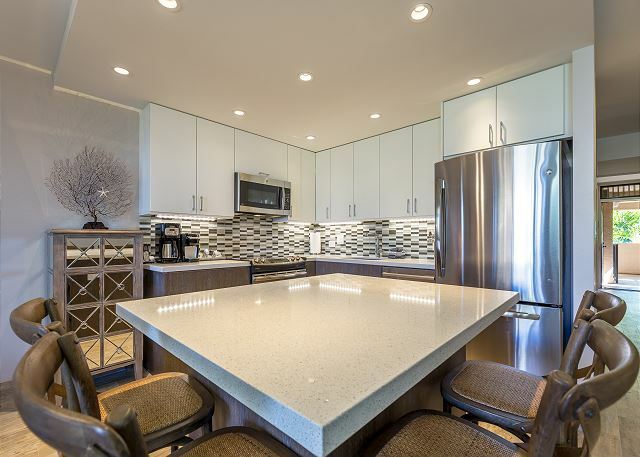 The condo is located within walking distance from Maui’s best beaches and restaurants, and a swimming pool and gym are at your disposal! Book your stay today and have the best Hawaiian getaway with PMI Maui Vacation Rentals!